Toucans are well known for their big colorful bills. Below we list numerous facts about this interesting animal that lives in the tropical rainforest of Central America, South America, and the Caribbean. These facts were written for kids and adults. You will find information about their huge beaks, where they live, what they eat and how they survive. 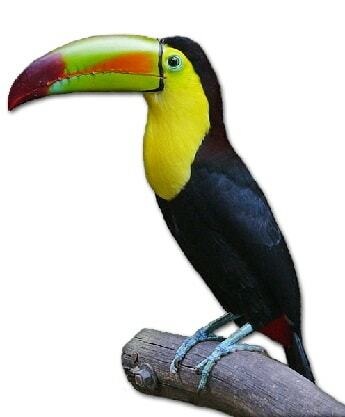 Click here for a great selection of Amazon.com books about Toucans. There are over forty species of toucans found in the tropical rainforest of South America. Their bright colorful markings provide them with excellent camouflage in the rainforest. They range in size depending on the species. The Lettered Aracari (Pteroglossus inscriptus) weighs approximately 4.6 ounces (130 grams) and is about 11.5 inches (29 centimeters) long, where as the Toco Toucan (Ramphastos toco), the largest species, weighs approximately 1.5 pounds (680 grams) and is about 29 inches (63 centimeters) long. Toucans live in flocks made up of approximately five to six birds. Toucans build their nest in tree hollows created by other animals; generally in the rainforest canopy. Toucans are omnivorous (eat both plants and animals). Their main food source is fruit which is plentiful in the rainforest trees where they live. They also consume eggs, insects, reptiles, small animals, and nuts. Their predators in the South American rainforest are generally large birds and wild cats. Other animals such as snakes and rodents may go after adult toucans but prefer to feed on their eggs. Toucans have sharp strong claws which enable it to hold tightly onto branches. Due to their beauty toucans are often captured and sold as pets. Toucans are born very small and do not reach their full size for many months. During this time both the mother and father protect it from predators. Toucans are not considered an endangered species. The rapid rate of the destruction of rainforests has pushed many animals to the brink of extinction. Since Toucans can adapt to survival in a variety of locations they remain unthreatened and thrive. Toucans have larger bills, in comparison to the size of their body, than any other bird in the world. Their large bill helps them keep cool in the hot environment in which they live. This adaptation is one of the best heat regulating systems in the entire animal kingdom. Arteries in their bills expand when the bird gets hot; and release heat. Their bill is big and may look heavy but it is actually extremely light. It is made of a spongy substance called keratin. Nails and hair of many mammals (including humans) is made of keratin. This birds large beak helps them reach food more easily. For instance they can more easily reach hanging fruit and reach deep into holes in trees to obtain food. This birds bill is not strong and is not an effective weapon against predators. However some animals may be intimidated by the size of the bill.